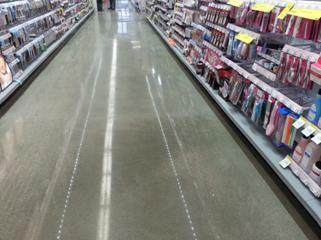 Concrete floor coatings in retail, restaurants or commercial buildingscan set the stage for a great first impression. Our goal is to make it easy to clean, safe for customers and guests to walk on while saving on utility costs with a light-reflecting floor. Concare's durable and seamless concrete floor coatings can be designed as stain resistant and impenetrable from chemicals, water or any liquids on the seamless concrete floor. We understand that the retail store, restaurant or commercial property can experience high volumes of traffic causing gouges, scratches, abrasions or other damage to the concrete floor. We offer a variety of retail, restaurant or commercial concrete floor coating finishes that can accommodate from low to high volume traffic. Contact Concare to view our sample colors and textures.